Whatever your views on Tyson Fury, you'll be hard-pushed to deny that he's anything less than an exciting character. From his barmy press conferences and erratic waistband, to his explosive in-ring performances – the likes of which shocked Wladimir Klitschko in 2015 – there's never a dull moment. Fury's latest encounter is against Safer Saferi, and we've found a way you can live stream the fight for free. The comeback road for Tyson Fury has been long and arduous. Following the sweet glory of that Klitschko victory, he's had his Sports Personality of the Year run petitioned against, title belts stripped and well-documented problems with both his physical and mental health. So his bout against the unfancied 39-year-old Albanian Sefer Serferi has been much anticipated in the boxing world. 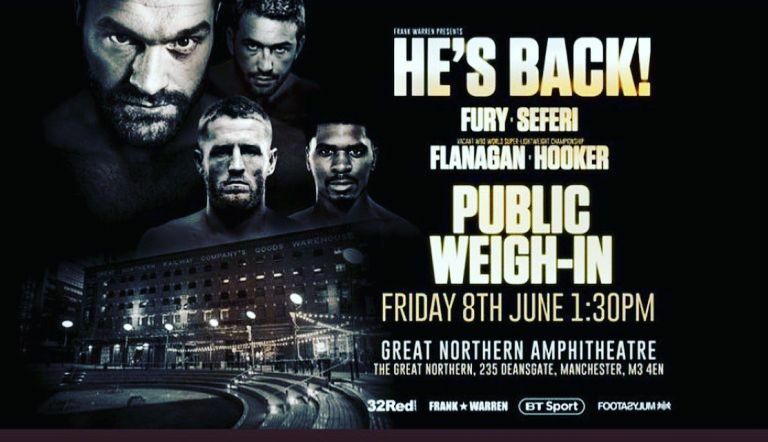 It may not be the world-class challenger we would expect for the former champ – it's more of a toe being dipped back in to the pugilistic waters – but Fury vs Seferi in Manchester tonight will still be worth a look. And the great news is that we've discovered a way that you can do exactly that for absolutely free. So read on to see what you need to do around 10pm BST (5pm ET, 2pm PT) this evening to live stream Fury vs Seferi. Although BT Sport has got the rights to show the boxing in the UK, the US station Showtime is streaming Fry vs Seferi on its YouTube and Facebook channels. Because of rights restrictions, these streams would ordinarily not be available in the UK or anywhere else in the world. But using a VPN means that you can virtually relocate your laptop's IP to a city in the US. That will allow you to watch the Tyson Fury live stream as if you were sat across the Atlantic – just follow our instructions below. Then you can either watch on your laptop or via a Smart TV, smartphone, tablet or pretty much any other streaming device. You just need to head to YouTube or Facebook at 10pm BST on Saturday. Once it's been downloaded and installed, open the app and select a US server location (it's super easy) and then head over to the Showtime YouTube channel or Showtime Facebook page from 10pm BST / 5pm ET / 2pm PT / 7am AEST in time for the first round.